I was born and raised Catholic and attended 12 years of Catholic schooling. I truly love my faith; however, I have often found it difficult to relate to the saints. Their lives have always seemed out of reach and far too perfect to be relatable, let alone be attainable. I always felt concerned that I might get too close to “worship” territory by praying to them. This past year, however, I started to explore the saints a little more and my perspective on previous ideas I once held started to change. This exploration has coincided with training for my first marathon, so naturally the two have intertwined. This is one of the most beautiful things about our faith - every part of us, every moment, is part of our journey to heaven, including running. After reading My Sisters the Saints, I became intrigued by the author’s journey to find and learn about the saints. I started to realize that saints are human and deal with their own sins as the author mentioned parts of these saints’ humanity and struggles. I also started to detach from the thought that I have to feel connected to all the saints or especially the more “popular” saints. Instead, it makes sense to find the saints that most speak to me and my life and the sins I struggle to uproot. By finally accepting this, I discovered there have been a few saints that have spoken to me throughout my life, influenced me spiritually, have brought more meaning to my training and running, and therefore, I’ve started to pursue a relationship with them more. I want to share these three female saints and the connection I’ve felt with them in the hope that others might find a saint they are attracted to as well. The one saint that I’ve felt a particular connection to ever since I can remember is Joan of Arc. In fourth grade at my grade school we did saint projects for All Saints Day. Joan was the only saint I really even considered researching. Her amazing zeal and the idea of a woman marching into battle in that time period really moved me as a fourth grader. This still speaks to me today as a working mom in the financial industry. Quite frankly, the fact that she was burned at the stake is absolutely terrifying while being an incredible testament to the length she was willing to go for Christ. I have thought of Joan during track workouts or the final miles of a long run and offered up that pain for God’s greater glory. While this is nothing in comparison to Joan’s suffering, I believe that it can be united to Christ on the cross and be used for good and not be in vain, even in the “small” moments of pain. Joan has been with me in those moments. Incidentally, I also chose Joan for my confirmation name as well. I can’t say until this past year that I was particularly diligent in asking for Joan’s intercessions; however, earlier this year after a particularly difficult time, a friend (who isn’t even Catholic) randomly gave me a Joan of Arc bracelet with her famous quote “I am not afraid, I was born to do this.” This small miracle blew me away! Thinking back, I think my patron saint knew I needed a boost. 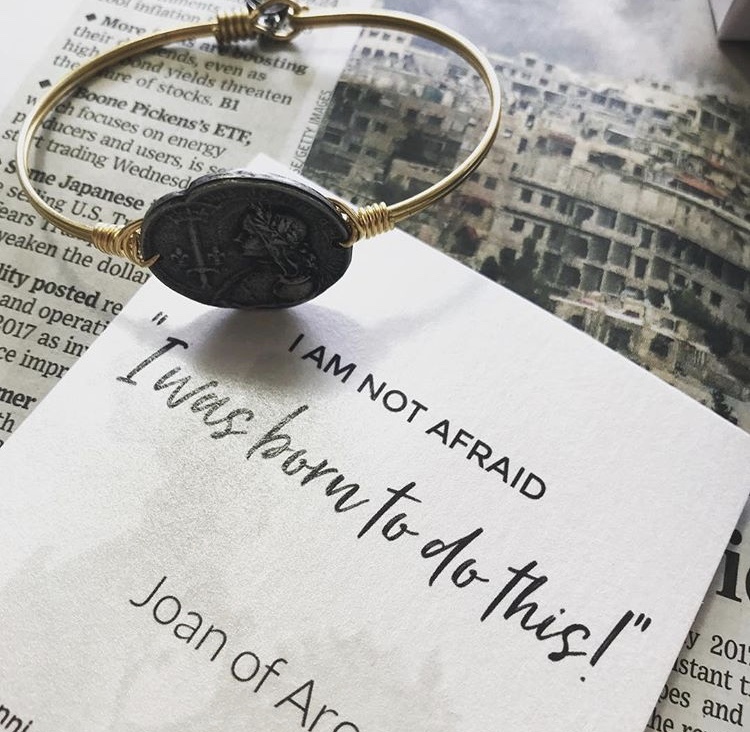 This small image of Joan on a bracelet is a great reminder on hard days and hard runs that I was born to live this life even when I doubt myself. I fully intend to ask for her prayers on race day. Sometimes training runs do make me feel a bit guilty for the time it takes away from my husband and children but I believe that as long as it’s not excessive, this excerpt explains the witness we can provide everywhere in our lives, including running. Ultimately, I have found that just like any friendship, a relationship with the saints takes time and commitment. They have so much to show us in how we can obtain eternal glory, but like a marathon, it takes patience and diligence and suffering to reach the goal. Which saint to you feel or have you felt a particular attraction to? What is it that draws you to their story? How might you develop a small devotion to this saint - a bracelet, a framed prayer, a quote, a book or a novena about them? What action can you implement in your life easily and during your runs to grow in your physical and spiritual strength? Campbell, Colleen Carroll. My Sisters the Saints. New York: Crown Publishing Group, 2012. Chalika, Jaya and Edward Le Joly. The Joy in Loving. New York: Penguin Group, 1996. Cost, Anne. Embracing Edith Stein: Wisdom for Women from St. Teresa Benedicta of the Cross. Cincinnati: Servant Books, 2014. Kolodiejchuk, Brian. Mother Teresa: Come Be My Light: The Private Writings of the Saint of Calcutta. New York: Crown Publishing, 2007. Erika Hayes is a working mom to two little girls. She was born and raised Catholic and has always loved growing in her understanding of the Church and her teachings. She started running about ten years ago, has completely three half marathons and is now currently training for her first marathon on September 29th in her hometown, Fort Wayne, IN. You can find her blog Cultivated Curiosity at www.erika-hayes.com or follow her @cultivatedcuriosity on Instagram.